Liverpool Pride is one of the most exciting and looked forward to events in the whole of the city. The festival returns this summer on July’s closing weekend for two days of fun, colour and celebrations. The weekend serves to recognise the value and impact of the LGBTQ+ community in Liverpool and celebrates the notion that love conquers all. Liverpool has a long history with the community and Liverpool Pride encompasses all that is great about Liverpool’s LGBTQ+ identity. For the second year running, St George’s Quarter will host most of the fun and there is plenty of live music, exhibitions and demonstrations throughout the weekend. Unfortunately, in some places around the world, LGBTQ+ people are not so warmly received, with 72 countries upholding laws against homosexuality and up to 13 countries still punishing homosexuality with death. 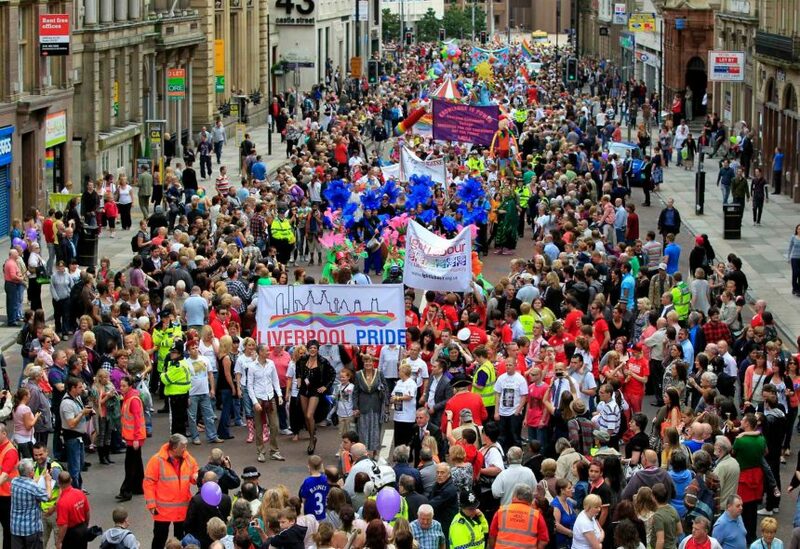 Liverpool Pride’s theme this year will celebrate all the community has achieved worldwide while highlighting the issues that are still to be addressed. The Pride March is an iconic part of any Pride festival and this year is set to be bigger and better than ever. Last year saw over 5,000 people taking to the streets of Liverpool to show their support for the community and this year, even more are predicted to take part. The March is going to create a sea of colour, music and celebrations in Liverpool, with all people marching in unity towards one shared goal. To help represent the theme of International Love, and to highlight the injustice in the 72 countries who have not yet legalised homosexuality, each of those countries flags will be distributed throughout the march. There’ll be glamorous Drag Queens, national dress/costumes and uplifting music. The Pride March is the pinnacle of Liverpool Pride and will be the most exciting and heart-warming demonstration you’ll see this year. 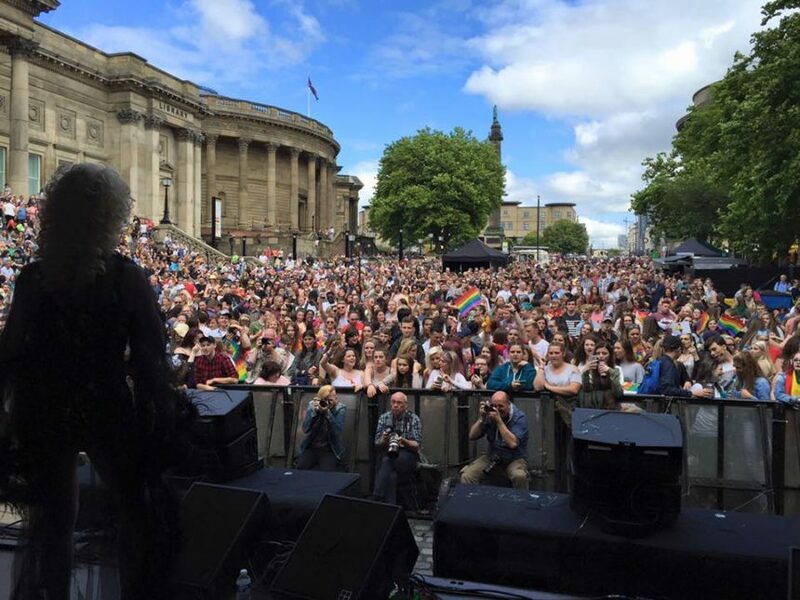 To really get the festival vibe going, Liverpool Pride will have three stages in St George’s Quarter, all showcasing the best of Liverpool and the community’s musical and arty talent. Take a look at what to expect across the stages. The Main Stage is the place to be at Liverpool Pride. After icon Marc Almond pulled out of his headline spot last minute, Liverpool’s very own Atomic Kitten stepped in to save the day. The noughties superstars are sure to make the Saturday Pride celebrations one to remember. Sunday’s family-friendly event will be treated to another Liverpool pop star as Marcus Collins takes to the stage alongside the winners of the Take That-themed Let It Shine, 5 to 5. The World on One Stage will help to celebrate the International Love theme, with collaborations with some of Liverpool’s most culturally diverse organisations. If you’re visiting Liverpool Pride this month, make sure you catch Africa Oye, Batala Mersey and Pagoda Arts Orchestra in front of St George’s Hall. The Garden Stage returns this year to showcase the best in Indie music and creative spoken word performances. The performances will be as diverse as the audience, guaranteeing something for everyone on this intimate stage. Liverpool Pride not only invites members of the community to celebrate, allies are invited to join in and support and educate themselves on what it means to be LGBTQ+. That’s why ‘We Are Family’ returns for its second year. The Sunday event provides a day of fun and entertainment for the whole family. With a fairground, arts and crafts and games for kids and a food market, bar and entertainment for adults there’ll be something for all ages during the final day of Liverpool Pride. A festival as uplifting as Liverpool Pride is bound to get everyone in the mood for dancing and a late night tipple. 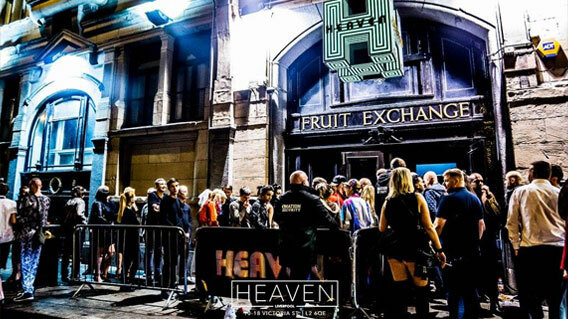 Luckily, Heaven nightclub in the Stanley Street Quarter has got you covered. The club is hosting a four-day event from Friday 28th to Monday 31st July. The venue will be decorated in festivals style with lasers, confetti and UV cannons all making an appearance over the weekend. Some of Liverpool’s favourite Drag Queens will be hosting and throwing sass and playful shade around the room. 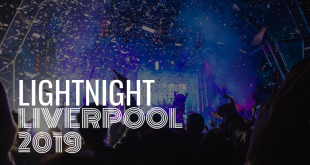 For more bars and clubs in the Stanley Street Gay Quarter, check out our post on the best loved gay bars in Liverpool and find the perfect place to dance the night away. 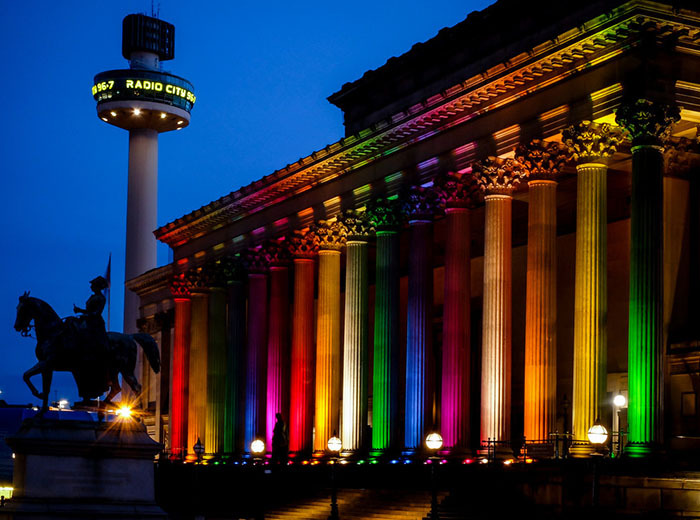 In 2016, more than 30 buildings and structures across Liverpool lit up in rainbow colours to help showcase the city’s alliance and support of the LGBTQ+ community. 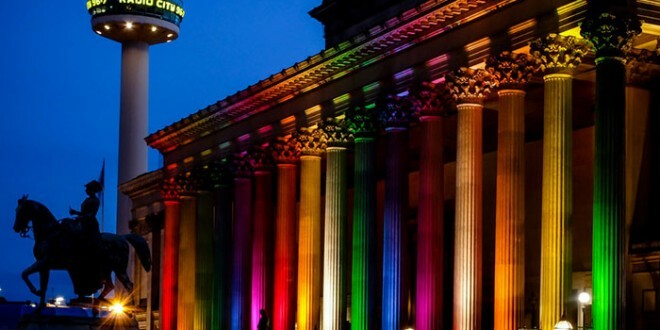 Iconic city centre buildings chose to light up in support and St George’s Hall, Central Library, Cunard Building and Merseyside Police Headquarters all shone colours of the rainbows across their bricks. This year, Come Out of the Shadows is set to shine a light on even more buildings in and around the city. Keep an eye out from the 20th July for the iconic Liverpool Pride rainbow that will illuminate the city. While many Pride events and festivities take place in July, International Pride Month, Liverpool Pride always falls on the last weekend of the month for a very sad reason. 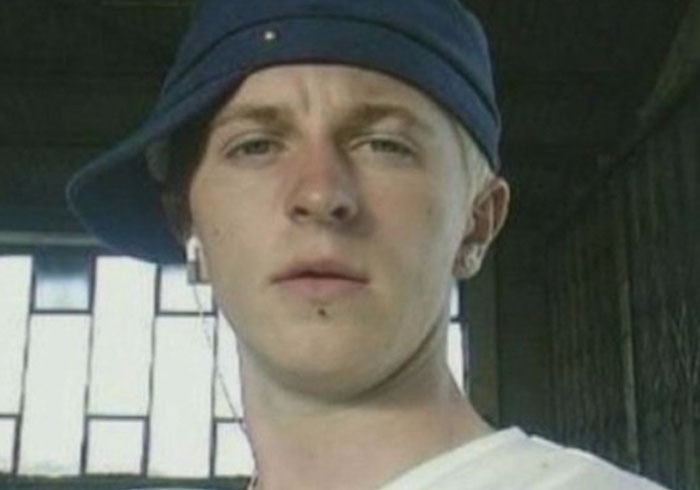 In 2008 Michael Causer, a gay teenager from Liverpool, suffered a homophobic attack at a house party and died from his injuries. Liverpool Pride was created in his memory to celebrate his life and create a support network to empower the community. Michael’s parents, Marie and Mike, created the Michael Causer Foundation to help with the legal costs and funeral expenses that came with the vicious attack. The charity now helps other LGBTQ+ teens find safe accommodation and offers them support to do so. Liverpool Pride is the community’s way of honouring and remembering the memory of Michael. There is so much to look forward to this year at Liverpool Pride, if you’re still not convinced, take a look at 12 of the best things about Liverpool Pride. Hannah is a journalism graduate with a keen interest in all things travel, food, and culture. If it involves adventure, chocolate, or finding something new in the city, she'll be there to tell you all about it.